← Why buy new when you can buy old? Many of us have a piece of majolica laying around somewhere. We’ve been told that it’s worth a fortune. It may be. Then again, it may be worth less than $100. But how can you tell? First, make sure it’s authentic. REAL majolica was made in the 15th Century – so forget about that. But it enjoyed a renaissance of its own in the 19th Century, where it graced fashionable Victorian homes. And, of course, it’s still being made today. And many reproductions are being passed off as vintage or antique. 1. Check the handles. Real antique majolica handles were applied on the outside. There should be no holes on the inside of the piece that reveal a hollow handle. Look beneath the handle on the outside, as well – some reproductions try to sneak in the firing hole, hoping you won’t notice. 2. Look inside. Even if the color doesn’t extend all the way to the bottom, the interior should be completely glazed. 3. Look on the base. A number can be a good thing. An “M” or “W” can indicate a reproduction. Ideally, you should have it checked by someone who knows majolica. This pitcher is authentic, and it’s old — most likely made in the late 19th Century. And it could be rare — I haven’t seen another one like it online. But valuable? Not really. A majolica expert told me it’s a “nice” example, but nothing to call Sotheby’s about. I have no intention of parting with it, anyway, because it’s one of the items that reminds me most about our great family times on Janvier Road. If you have majolica, it’s worth doing some research before you give it away – or even worse, sell it at a flea market! Here’s a fun site with lots of photos to get you started. And don’t forget to visit Janvier Road on Etsy today! This entry was posted in Majolica. Bookmark the permalink. 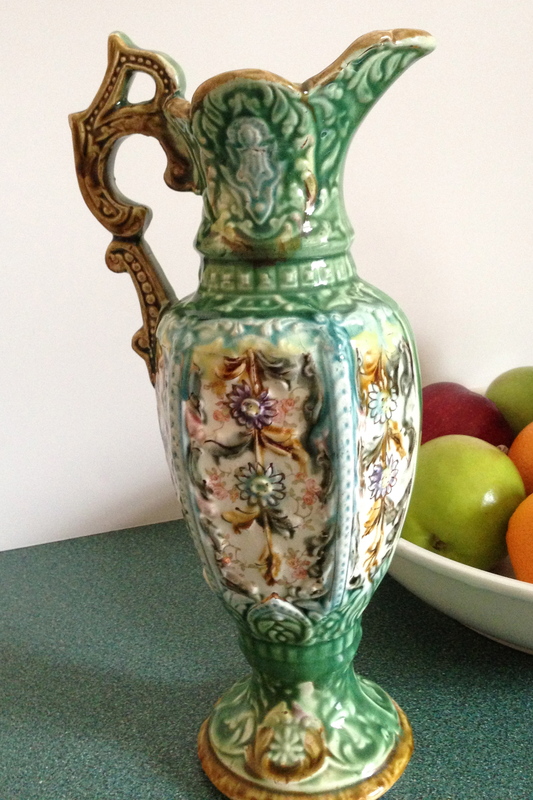 2 Responses to Granny’s majolica: Is it worth $20,000 or $20?